Gautama Buddha, the founder of what is now known as Buddhism, throughout his lifetime always taught his direct experiences and absolute realisations to others, with the motivation to benefit all sentient beings. Being a Buddhist, I have been using this particular term ‘inner wealth’ as a medium to share Buddha’s teachings with others who may benefit from it. Depending on what we are searching for, there are various kinds of wealth in life. Just ask yourself or look up the term in a dictionary, and you will find that there are almost endless possibilities. One way of defining wealth is that it is a means to fulfil our desired aims. Absolute prosperity is the state of cessation of the causes of anxiety and confusion (karma and klesha). The path to overcome anxiety and confusion and their causes is ‘inner wealth,’ so to speak. Listening to the Buddha’s teachings: listening repeatedly to the teachings that show that mind possesses the inherent potential to cultivate true kindness and genuine wisdom for the benefit of others. If this potential or essence is cultivated through perseverance it is truly achievable. Contemplating on the teachings one has listened to: inculcating ourselves with the knowledge gained from the teachings through sound reasoning, so as to dispel all doubts. Meditating on the facts, once all the facts have been made known theoretically or conceptually to the mind, to a point where, for example, the mind knows that fire truly burns. At this stage the mind actually attempts to focus on true kindness and genuine wisdom with one-pointed concentration, repeatedly. The experience of meditation is like getting into a character, like someone who’s forgotten his or her identity. Relying on this method called meditation seems to require the person to get into that character, all the while not realising that that very character is yourself. The means of meditation is one of the most important parts of practice to a Buddhist, because it is the final step to begin acquiring absolute prosperity. 對於初接觸藏傳佛教的人來說，甚麼是良好的修行方法？ What is a Good Practice to Start With for People Who are New to Tibetan Buddhism? Traditionally, when you begin Tibetan Buddhist practice, you take refuge in the Three Jewels, and start with the preliminary practices. But personally, I feel that if one is truly starting from step one, you must first have this attitude: ‘I want to be decent. I want to draw from the Inner Wealth within.’ This is the foundation upon which you can then follow the traditional aspects of the practices that are offered. The first step is reflection. Knowing that this Inner Wealth lies inside you, you may reflect on your own consciousness and try to see if there is an innate sense and understanding of cause and effect, an innate sense of aspiring for truth and peace. 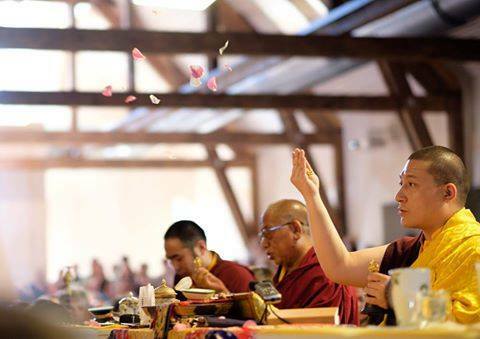 If we discover these things, then this is already the first non-traditional practice on the Tibetan Buddhist path. To cultivate this Inner Wealth more, you can then begin with all the traditional practices, reflecting on questions that are grounded in logic and reason. For example, is it logical that if you want to learn something, you must learn from someone who is experienced, and follow their path? Is it logical to have a great, positive attitude? Is it relevant to have decency, be it in the way you think, the way you talk, and the way you behave? Does intention matter more than what you do? If all these seem reasonable and logical, then it is already a step on the path to realising more of yourself and tapping into your Inner Wealth. Then, you may also examine the traditional aspects of the practice, for example the Theravada, Mahayana and Vajrayana traditional practices, and see if each one resonates with your own logic and reason, like the questions I just mentioned. By doing this, you won’t just blindly jump into a way of life. Otherwise, if you don’t do any of these things at the beginning, then you may face the problem of feeling that you have to adapt yourself to something completely new. Then it becomes a little bit unnatural. From time to time, or even from the start, you might have the feeling that it’s not really according to your nature, according to your constitution — you’re just adapting. Let’s say you are born and raised in the city and then go to live on a quiet, remote island. You could try very hard, but it would be a struggle to adapt. After some time it will still not be easy — it is not easy at the beginning, it won’t be easy in the middle, and it won’t be easy at the end. Because in every aspect, you feel that you have to adapt to something that is not really in accordance with your nature. So in a similar way, you may have a sort of allergic reaction against the practice – which is not good! So instead, to adopt rather than adapt, you have to relate to it as if there is already an inherent connection. Like for example, I am a Tibetan, but there is an inherent connection with East, West, South or North, simply because I am a human being. So in that way there is no difference at all. And then, just like that, there are so many similar things. There is no need to adapt! While the logic of this thinking is correct, it is applied in the wrong way. Emotion is not a part of you, it is just a temporary habit. You are not inherently angry, or inherently any emotion. Emotions pass. The path to spirituality is about discovering your true nature, tapping into your Inner Wealth. Understanding this point, almost automatically negates the idea that spirituality or practice is a way to alter a person’s true nature. For these reasons, reflecting on our motivations, logic and reasons for practicing are important non-traditional first steps, before setting out on the more traditional Tibetan Buddhist path.